Home / airport / News / sihanoukville / Sihanoukville International Airport is undergoing an upgrade. 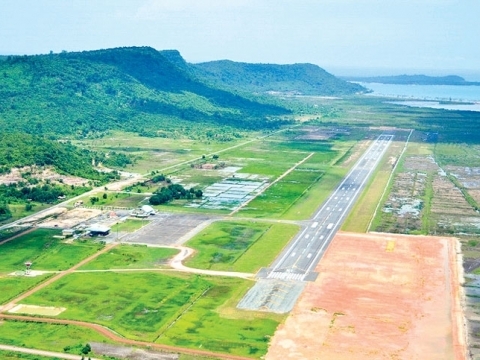 Sihanoukville International Airport is undergoing an upgrade. SIHANOUKVILLE (Khmer Times) – Long overlooked, Cambodia’s third international airport is undergoing a major upgrade, big enough to firmly place it on Southeast Asia’s tourism map. By the end of next year, it is be ready to handle 10,000 air passengers a week. The airport’s expansion will directly boost coastal tourism, trade and jobs, economists say. The terminal expansion is to be completed by November, in time for new flights expected for the start of the high tourism season, according to Norinda Khek, spokesman for Cambodia Airports. This is a public private partnership that operates the country’s three airports with commercial service. Flights between Cambodia’s three airports are to increase in frequency and capacity, he predicted. In the first three months of this year, passenger arrivals are up 120 per cent over the same period last year. But that is from a low base, 17,500 in first quarter 2014, to 39,000 this year. Cambodia Angkor Air and Bayon Airlines offer daily flights between Siem Reap and Sihanoukville. Sky Angkor Air flies three times a week. This time last year, only one airline made this one-hour flight. Bayon also flies between the capital and Sihanoukville. This 35-minute flight linking Sihanoukville to Phnom Penh is on Fridays and Sundays. As well as domestic flights, more charter flights from Singapore and China are expected. The first Silk Air flight from Singapore touched down June 6. More charter flights are planned in December, when air travel from Singapore peaks. “Silk Air has also scheduled more charter flights,” Mr. Khek said. In July, Sky Angkor Airlines resumes charter flights here from Hangzou, China. Prak Visal, deputy director of administration at Preah Sihanouk Provincial Hall, says talks are underway for flights linking Sihanoukville with Vietnam and to the Thai resort island of Phuket. He said test flights from South Korea’s Incheon International Airport were discontinued due to lack of demand. Flights from Bangkok: A Game Changer? The game changer for the coast will come, experts predict, when regular commercial service starts between here and Bangkok. This is Cambodia’s air hub for long-haul flights from Europe, the Middle East and Australia. Stephen Lim, president of the provincial tourism association, is upbeat on the airport’s upgrade. His family owns hotels behind Ocheauteal Beach and is building a luxury condominium project on Independence Beach. He predicts Sihanoukville’s airport will one day become the busiest in the Kingdom. First built with Soviet aid in the 1960s, the airport has a single runway. But, at 2,500 meters, it is long enough to accommodate the largest commercial jets. The runway is as long as the one at Siem Reap International Airport, and only slightly shorter than Phnom Penh’s. Along with the passenger terminal, other facilities – such as traffic control – will need to be upgraded and staff hired and trained, officials said. A dedicate electric power line has been built. A jet fuel tank farm is under construction. Second Coast Airport: Koh Rong? A second international airport is reportedly planned for Koh Rong, Cambodia’s second largest island after Koh Kong. Cambodia Airports staff declined to comment on this venture, which would most likely be outside their partnership. That airport will reportedly be built by Royal Group, which has leased most of the island for a big development project. “It’s critical and it will bring broader demographics of visitors and take some of the burden off of Cambodia’s roads,” Mr. McColl added.